With the snow gradually piling up, there are getting to be more and more snowmobiles hitting the trails, and this year there is a new trail in the Belgrade-Brooten-Elrosa area. Seeing a need for additional trails in the Belgrade-Brooten area, organizers meet in March to see if there was interest in forming a new snowmobile club and building more trails. A new snowmobile club was formed and they have been busy getting permission and laying out a 45 and 50 miles of new trails to help area riders connect with other trails in the state. The Bonanza Valley Trail Blazers have just recently completed signing the new trail which connects with existing trails by Elrosa, Lake Henry, and Sibley State Park. In the future, a proposed trail would connect the Bonanza Valley trail to the Douglas Area Trail Association taking riders to Glacial Lakes State Park and Villard. With a $1,000 cash donation from the Sno Barons Snowmobile Club of Blaine and other individuals, signs for the trail were made possible. The new trail is ready. Groomers were out earlier this week preparing the trails for use,” Anderson said. This year, the New Munich Snowmobile Club has agreed to do the grooming. The trail is only for use by snowmobiles. No ATVs are allowed. 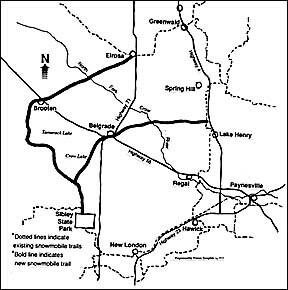 Maps of all the snowmobile trails in Central Minnesota are available at area sports shops. Anyone interested in making a contribution to the Bonanza Valley Trail Blazers or to become a member, can do so by sending membership fees to Box 614, Belgrade, MN 56312. Single membership (18 and older) is $20 and families can join for $25.